My family begs for chicken alfredo often – do I mind? Nope! Homemade alfredo sauce is one of the easiest recipes I have up my sleeve and everyone loves it, including the kids. Before I go much further though, I must mention, this is not lowfat. It’s an alfredo sauce with heavy cream, so it’s hearty and a once in a while guilty pleasure, but I can assure you that it’s worth it and tastes just like the alfredo sauce that you’d get at an authentic Italian restaurant. If you’ve been around here for any amount of time, you know that I love easy meals. Any more than five or six ingredients, and you’ve lost my attention. If you’re like me you’re going to love making this dinner as it’s so simple and absolutely delicious. I also love the fact that you can top the pasta and sauce with anything. I’ve done chicken, shrimp and even salmon. This dinner is delicious with any of these options and perfect for busy nights, as it comes together so quickly. To make this even easier and quicker, I recommend precooking your meat. The sauce does separate kind of quickly due to the ingredients, so if your meat is ready right when your noodles and sauce are, it makes the perfect, easy, and (most importantly!) easy to clean up meal. 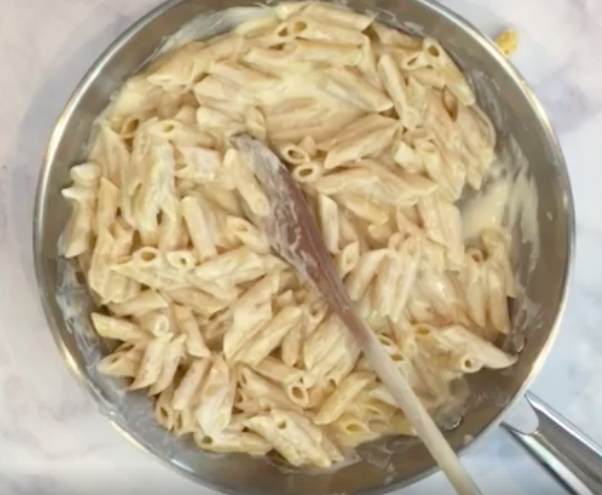 What’s in Homemade Alfredo Sauce? In my alfredo sauce I use butter, heavy whipping cream, and parmesan cheese. I also add garlic powder to taste once the sauce is cooking, depending on who’s eating with us. 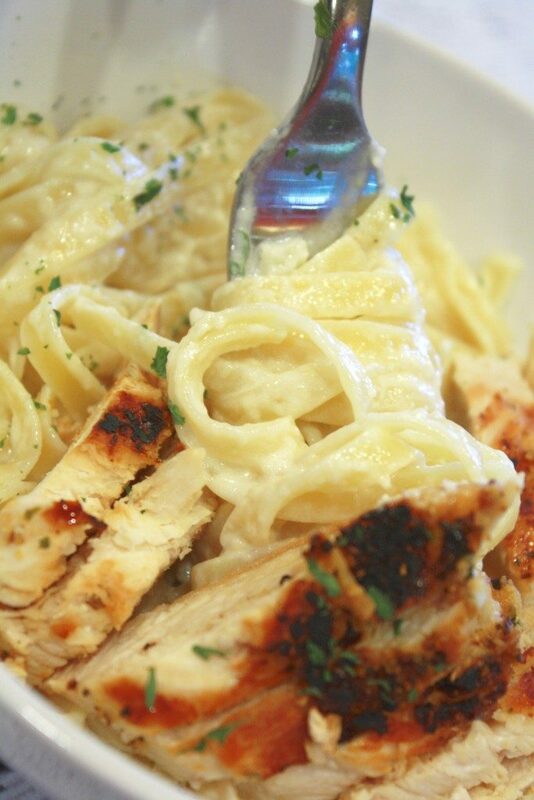 The kiddos love a more plain alfredo, whereas for me … bring on the garlic! I have also seen people add cream cheese to make the sauce thicker. I do not usually add cream cheese, but again, that’s all personal preference. 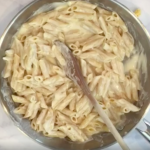 Can Homemade Alfredo Sauce be Frozen? Since this homemade alfredo sauce comes together so quickly, it is definitely better fresh. I wouldn’t recommend freezing and thawing this sauce as it will likely separate when it’s thawed and get too oily and greasy. I ALWAYS use McCormicks Montreal Chicken seasoning on the meat that I’m serving with this. It gives the meat a fabulous taste and goes perfectly with the alfredo and pasta. Homemade alfredo sauce is one of my personal favorite easy dinner recipes that I make - everyone loves it. If you're looking for a kid friendly dinner that even the adults will love, you need to try this recipe. It's delicious! 1 1/4 c. grated Parmesan Cheese I use Kraft or Sargento. You can use the stuff with the green lid, too, but the sauce will be grainy. Melt your butter and whipping cream on medium low heat in a saucepan and whisk until the mixture comes to a rolling boil. Add the parmesan cheese to the pan. Stir constantly with a whisk for 10 minutes or so, until the cheese has melted. Remove from heat and let stand to thicken for about three to five minutes (it will be runny at first but it will thicken). Pour over cooked pasta and toss. Add chicken or shrimp on top & enjoy!